Mésmera grew up in San Diego, CA, where her childhood was all about movement: swimming, gymnastics, baton twirling, water ballet, hiking and cookouts, all under the initiative of her father, Coach Rose. Whenever the men were not around and the desire hit, her aunt, grandmother and mother would put on music and dance. Discovering Modern Dance in High School fanned the spark in Mésmera, yet it was not until 10 years later, when she saw her first bellydancer, that her passion for the dance became her passion for life. Spinning her veils through 40 years of classes, performances, seminars, videos, festivals, film and TV credits, celebrity parties and directing Troupe Mésmerasha has shaped her into a dancer with depth and intent. Her articulate clarity of movement carries through to her teaching ability, making the learning experience most satisfying. Mésmera encourages and empowers freedom of movement in dance as a creative paradigm for life. She draws from many sources: archetypes, geometry, anatomy, kinesiology, colors, Deities, animals and Nature. She integrates knowledge, awareness and Spirit and actively generates the embodiment of these elements with her students. The grace with which she blends heart and consciousness is inspiring, joyful and vital, bringing her entertainment art to a moving experience for her audience as well as her students. There is definitely more than a shimmy happening here, and that is why her name is Mésmera. Mésmera offers classes, workshops, DVDs for home study and a line of dance accessories, including her beautiful & versatile T'Unique tunics, available on Etsy HERE. A wonderful night to celebrate an amazing bellydance career! 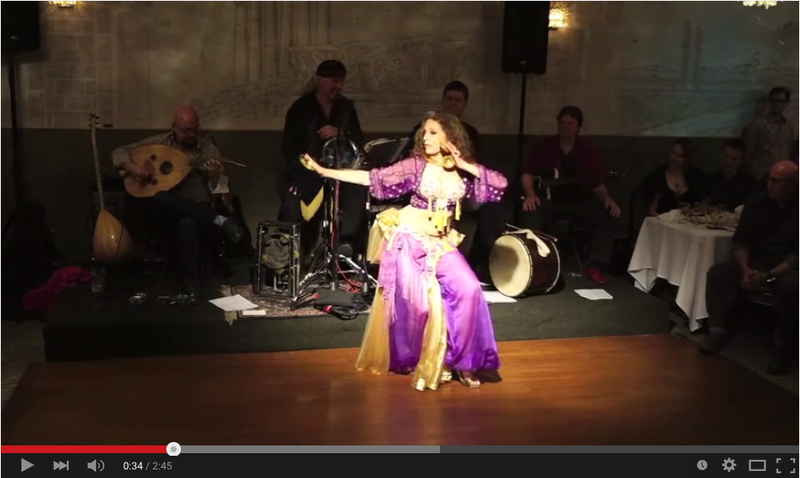 Here's a little taste of Mesmera's performances from her 40th Anniversary Party along with Brothers of the Baladi and more!